At the Unit's monthly meeting last night Chief Fire Officer Glenn Teal announced the appointment of 3 Senior Station Officers: Ross Bay, Len Day and Allan Officer. The Unit has not had SSOs since its structure was altered about 15 years ago. "It's timely to promote these 3 officers to senior positions to help manage the Unit, to meet our Business Plan and to assist on the fireground" says Glenn, "and with the change from Fire Police to Operational Support in 2011 there will be additional challenges, opportunity for increased participation and, perhaps, a wider scope of duties. On top of this there'll be the introduction of a new formalised training programme for all members (TAPS), and while these are interesting and exciting times for the Unit, it all means additional management effort will be required for New Zealand's biggest and busiest volunteer brigade. The new Senior Station Officers will provide this". Members of the Unit were among invited guests at today's traditional Indian-style wedding of one of their colleagues, Deepak Chand who married Rennie, daughter of Ramesh and Shila Ram. One of the Unit's vehicles led the wedding procession to the Mahatma Ghandi Centre in Eden Terrace, where Fire Police were awaiting the groom's arrival, forming a Guard of Honour. Several hundred people witnessed the formal proceedings, a colourful ceremony in Mahatma Ghandi Centre specially decorated for the occasion. All members congratulate Deepak and Rennie and wish them a happy life together. Early afternoon the Unit was called to assist at another motor vehicle crash on Dominion Road, this time a little closer to the city near the corner of Bellevue Road. A car and a motorcycle collided leaving the rider dead at the scene and the pillion passenger seriously injured. For the second time today a large portion of Dominion Road was closed. Detours, some staffed by Fire Police, were in place for more than 3 hours while emergency services attended the injured. Police completed investigations and salvaged the vehicles. 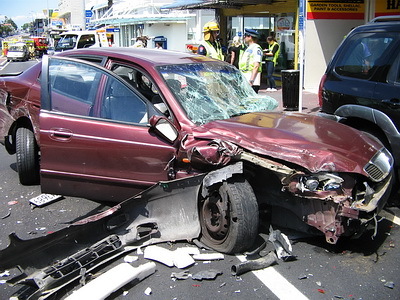 Members assisted, late-morning, on busy Dominion Road where seven vehicles had been damaged following two separate crashes in the Mt Eden Valley Road shopping centre. This area is usually heavily congested with slow-moving traffic, so it was difficult to imagine the damage incurred to several of the vehicles. One woman, suffering neck injuries, was cut free from her vehicle and another occupant was also taken to hospital. Witnesses told police a red car sped along Dominion Road towards the city, first colliding with 3 cars then continuing on to a second impact with 3 more vehicles 50 meters towards Valley Road. One SVU was pushed on to the footpath. Police said it was lucky no pedestrians were injured as the action unfolded. Dominion Road was closed to traffic in both directions until patients had been removed to hospital and the vehicles taken away: 4 so badly damaged they had to be towed away. A serious motor accident at Hobsonville on Friday night signalled the start of what Fire Police Chief Glenn Teal describes as a "HUGE" weekend. Members had just completed tasks there when their colleagues were requested to respond with the Canteen to a major fire in Te Aroha. Then on Saturday morning 15 members assisted with traffic management at Panmure's Santa Parade while others were at Devonport Volunteer Fire Brigade's Open Day, just one of the celebrations marking its 125th anniversary. That night further members assisted at Devonport's formal function on North Head. 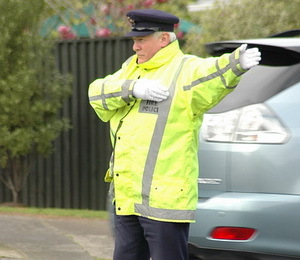 Then at 11.30pm pagers summoned members to a fatal road crash in Mangere. Sunday, and members were back assisting with Devonport Brigade's activities while many more were helping at the 111 Emergency Open Day at Henderson. Only to be interrupted by another fatal motor accident in Botany Downs and a 3rd alarm warehouse fire at Albany. "Between planned events and the emergency callouts, it was a very busy weekend", says Glenn "and all members have been thanked for their efforts". Devonport Volunteer Fire Brigade, on Auckland's North Shore, celebrated its 125th anniversary over the weekend. Representatives of the Unit attended the function last night and assisted at some of the other activities held to mark the beginning of Devonport brigade in 1885, the oldest surviving volunteer brigade in Auckland. There was an Open Day at Devonport fire station yesterday while the function last night was attended by the Chair of the Fire Service Commission, Dame Margeret Bazley, local dignitaries, fire service executives and past and present Brigade members. Today Devonport's first motorised appliance, a restored Ford Model T, took its place in the local Santa Parade, followed by a display on Windsor Reserve, site of the first Volunteer Hook and Ladder Brigade's station 125 years ago. It's official! 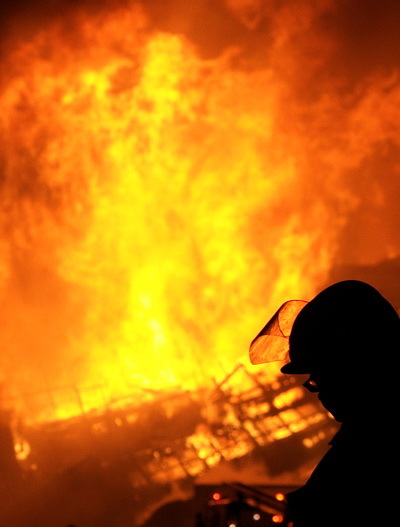 The New Zealand Fire Service has promulgated long-anticipated policy that does away with the name "Fire Police", replacing it with "Operational Support" and spelling out the duties that present Fire Police may carry out when they become Operational Support personnel. The Fire Service Commission has confirmed that the present functions and capabilities of Fire Police will be fully retained and Paul McGill, Director of Operations and Training, told the UFBA Conference at the weekend that the policy also gives opportunity to promote and enhance Operational Support activities by volunteers. 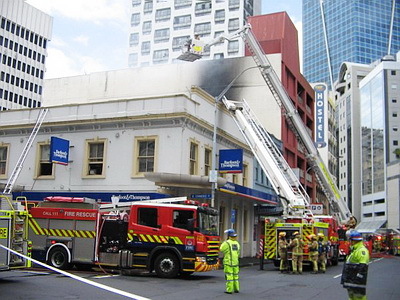 Auckland Fire Police Chief, CFO Glenn Teal, welcomes the new policy..."rebranding of the Unit provides an exciting future for our members and will take place in 2011. Meantime, it's business as usual". Auckland Fire Policeman Russell Allen has been elected to the United Fire Brigades' Association (UFBA) competition panel, the body responsible for organising all the Association's Challenges. His new position was announced at the UFBA's annual conference which concluded today in Wellington. He was elected unopposed. Russell joins a panel of 3 others which sets the rules and organises nation-wide fire brigade contests: Waterway, Road Crash Rescue, Drivers' and Combat Challenges. In 2011, in addition to the usual calendar, the panel will oversee an international event to be held in Canterbury, the Australasian and World Crash Rescue Challenge, and a return of the local Combat Challenge. Russell has wide experience in challenges, particularly Waterway events, a touch ironic because the Unit's members seldom engage with waterway equipment on the fireground - it's not a core duty. One of the Unit's longest serving members, Len Nola, has stood down from operational duties but remains on the Unit's roll to continue his service off the fireground. Len came from a fire brigade family (his father and uncle were both volunteer firemen at Mt Roskill in the 1940s) and joined the Unit in April, 1975. A former Station Officer in the Unit, he's a retired manufacturing jeweller. Len still works part-time and will continue his service with the Unit on its roster for Radio Operators and to assist at Fire Service events and at major incidents, fulfilling duties off the front-line. The Unit's Chief Fire Officer, Glenn Teal, says non-operational roles for support personnel have been spoken of for some time, and recent moves by some of our other members to this category anticipates imminent policy changes. "It gives new opportunity for those wanting to continue membership, supporting the Unit in ways other than turning out to emergency calls", Glenn says, "and we benefit by retaining their invaluable knowledge and experience, in Len's case built up over nearly 36 years". 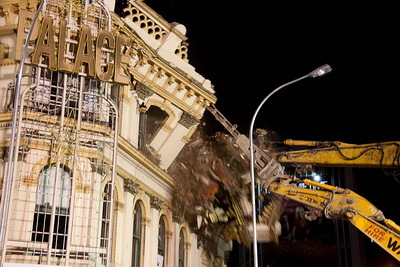 First bite as the diggers tear into the old "Aurora"
Members were called to assist in Victoria Street and surrounding intersections in the Auckland City last night when the old 3-storeyed heritage pub, "The Palace", became unstable, threatening to fall. It had been under extensive renovation. Its walls were bulging, parapets contorted out of alignment and large cracks grew in the upper structure. The sounds of an occasional breaking window punctuated the risk of imminent collapse. Surrounding buildings were cleared, businesses closed, roads closed. Fire Police also maintained security at inner cordons until around midnight when City Council officials decided to demolish the building in the interests of public safety. Members then remained while the 124 year old pub, originally "The Aurora", was made safe: reduced to rubble by demolition gangs. Ironically the name "Aurora" is usually associated with the dawning of a new day or era, no doubt appropriate when the brand new hotel opened in 1886. But today it was definitely Closing Time. 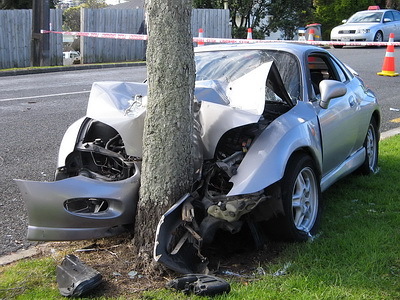 Auckland Fire Police responded to a road accident involving a car and a bus on Old North Road, Kumeu, and maintained road closures on the busy highway until scene investigations concluded and the road was cleared of the vehicles and debris. Passengers in the bus - 20 or so secondary school pupils - escaped with minor injuries treated at the scene, but the driver of the car was killed and two passengers seriously hurt. The accident happened just after 4pm on a winding, sloping part of the road. Members ended duties just on dusk when the road was reopened. "It was expedient that we finished before nightfall", said S.O. Allan Officer, Fire Police OIC, "otherwise we would have rearranged and reinforced traffic management measures to cater for reduced visibility in the dark and the fact that the accident scene was on a winding, hilly road". October statistics show it was another busy month for the Unit with 57 responses, almost double the number in the same month last year. Among the calls, no fewer than 18 house fires, including 3 responses to the same Mt Roskill house in the course of a week. Other notable turnouts included assisting Silverdale Fire Police at a rural fire at Dairy Flat, an accident in Green Lane involving a bus and 6 other vehicles, a house fire in the southern part of the region at Puni and a greater alarm fire at a nursery near Kaiwaka, one of the northernmost calls the Unit has attended. And in the far south-east of the territory we serve, members assisted at a multiple alarm, a scrub fire, at Kawakawa Bay. 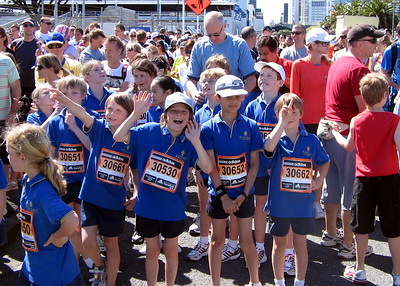 The Unit assisted at the annual Auckland Marathon today to get more than14,000 runners and walkers safely around the 42 km course which took them through North Shore streets, over the Harbour Bridge, across the CBD and out to St Heliers Bay and then back to the CBD. 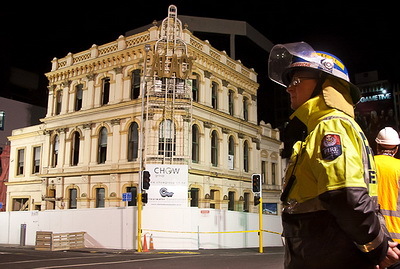 Race organisers acknowledged members' traffic management skills when they stationed Fire Police as marshals at some of the most sensitive and busiest locations at Westhaven and in the CBD. 37 countries were represented, participating in the full 42km race, or the lesser half-marathon, a 5km marathon or several walks. Members staffed road blocks from 6am ensuring wheeled traffic did not tangle with participants. Members have been assisting overnight at a bush fire near Kawakawa Bay in South Auckland, a 3rd Alarm blaze that swept through an estimated 8 hectares and at one stage extended along 3 kilometers. A helicopter was used to, along with multiple hoselines, to contain and quell the fire. Smoke from the fire reduced visibility, and because of its proximity to the main route to Kawakawa Bay, meant the road had to be closed. 3 Fire Police appliances attended... one unit closing the road at Clevedon township, another assisted on the fireground together with the mobile canteen. 12 members were involved, most for more than 6 hours. Labour Weekend was a busy period for the Unit, with 11 calls, and at one - a motor accident on the North Shore - we were able to assist Police photographing the scene. It was a busy night for police with 2 serious accidents at the same time; the single car crash on the North Shore and a 3 car smash in Kohimarama. The duty police photographer was busy at Kohimarama and then there was a fault in the camera carried by the Serious Crash Unit at the North Shore incident. Fire Police, already on the scene, stepped up when one of the Unit's resident photographers, Nick Clifford, offered to help. It was readily accepted. He took the pictures as directed by crash investigators. And just as the scene was being cleared some members left, responding to another of the holiday weekend callouts, a 2nd alarm fire in a school at Glen Eden. Members turned out this evening to Kaiwaka, where there's a major fire in a nursery beside State Highway 1 just north of the township. A large commercial shed was destroyed in the blaze which has been attended by fire crews from as far afield as Whangarei and Auckland. Drums of horticulture chemicals in the fire have received particular attention from fire officers. Fire Police are staffing the mobile canteen at Kaiwaka Fire Station, rather than the fireground itself, to avoid any effects from fumes given off by the chemicals. 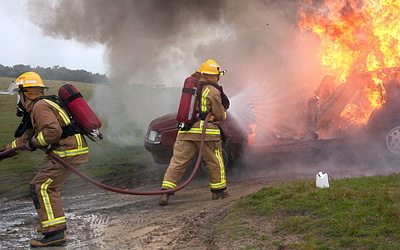 While there's a trend for fire brigades throughout New Zealand to attend fewer fires... and more calls to rescue and other emergencies... Auckland Fire Police annual statistics show that about half their total call-outs for the year... 539 responses... were to fires. Chief Fire Officer, Glenn Teal, told the Unit's recent Annual General Meeting that it had been another busy year, and not just responding to call-outs, (The Main Thing), but assisting at a myriad of Fire Service exercises, gatherings to spread the fire safety message and community events. "Add training sessions and fund-raising activities", Glenn says, "and you can see our members have again shown great commitment, volunteering their service to the Unit and the community". Glenn also paid tribute to former CFO Jim Smith who stood down as Chief during the year and also foreshadowed changes to the Unit's administration which will be introduced in the ensuing year. "And with 539 responses, and all of them working jobs, the Unit retains its claim as the New Zealand Fire Service's busiest volunteer brigade", Glenn added. Members assisted at a multiple-vehicle road accident in Greenlane this morning following a collision involving a bus and 7 cars. Fire Police maintained road blocks in Wheturangi Road for more than an hour while the incident was investigated and the vehicles salvaged. 2 injured people were taken to hospital and 6 cars plus the bus had to be towed from the scene. Reports indicate the bus suffered brake failure, causing the multiple nose-to-tail shunt among the cars which were in a queue waiting for traffic lights at the Green Lane intersection. There are 4 new elected members on the Management Committee following the Unit's 77th Annual General Meeting ... and further changes were signalled by Chief Fire Officer, Glenn Teal. Those elected are Hayden Chisnall, Tim Dickinson, Andrew Galloway and Hamish Kyle and all with the exception of Andrew are newcomers to the Committee. Chief Teal welcomed the four to the Committee saying he looked forward to working with them in their new role helping to administer the Unit. He thanked the previous members on the Committee for their contributions. During the AGM Glenn also spelled out changes to management and administration of the Unit which he said will better suit the workload and operations of New Zealand's biggest and busiest volunteer brigade. 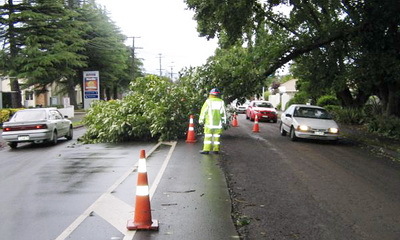 Blustery weather with high winds and passing squalls continue in Auckland, and elsewhere in the country, resulting in Fire Service response to fallen trees, power wires down and lifting roofs. While nowhere near as busy as over the weekend assisting at a spate of storm-related incidents, members are still turning out to problems caused by the week of unsettled weather. But one incident in Henderson was not connected with stormy conditions - Unit members assisted with traffic management and scene safety where a window-cleaning operation at Waitakere Courthouse went wrong. 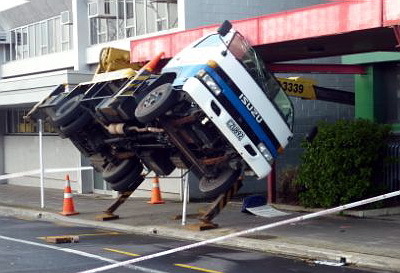 A cherry-picker, being used to access upper floor windows, capsized. 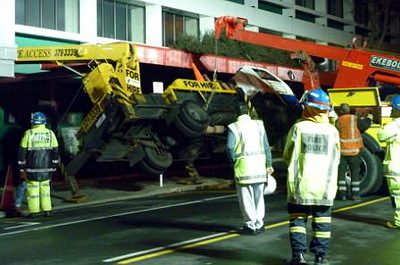 The cab of the overturning truck was jammed under the veranda while the platform fell to the ground in an alleyway beside the Court building. Luckily the window washer escaped unhurt. Fire Police closed the road until Labour Department and Police completed investigations and, in a tricky operation, the vehicle was salvaged. Members put in many hours overnight at call-outs associated with the fiercest storm in Auckland's living memory, attending weather-related emergencies in Mt Wellington, Panmure, Kumeu, Mt Eden and Papakura. 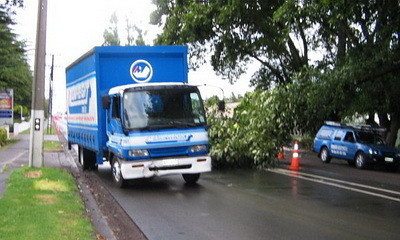 "We may not have been the busiest brigade dealing with storm damage" says Fire Police Chief Glenn Teal, "but we certainly had the longest single job: 7 hours at Kumeu closing the Riverhead - Coatesville Highway and putting in diversions, where a large tree, entangled with live power lines, blew down blocking the road. Earlier, late afternoon, 9 members assisted with traffic management at a 3km-long oil spillage on the roads between Garnet Road, Westmere and College Hill, Freemans Bay. And while emergency crews across Auckland were stretched attending to storm damage, a further 8 members were assisting police with roadblocks and scene protection at a fatal motor accident in Church Street, Onehunga. 2 people died in the crashed car which had earlier been pursued by police. In the 12 hours from 5pm Friday to 5am Saturday the Unit's volunteer members contributed more than 200 person-hours. A new Ford Transit van, its fit-out just completed, has joined the Unit's urgent response vehicles. With call-sign Fire Police 4, it replaces a Nissan van which has been retired. The Transit's long wheel-base version was selected to enable stowage of the range of equipment the van transports to emergencies. "This added carrying capacity, the head-high roof which enables walk-in entry/exit and the second row of seats for a crew suits our purposes" says Fire Police Chief Glenn Teal. 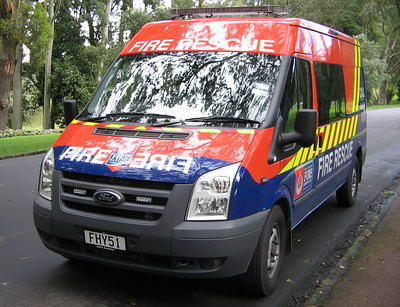 The van has the New Zealand Fire Service's most recent livery and joins the Unit's 2 Mitsubishis. Fire Police joined scores of fire-fighters for the annual 9/11 stair-climb in memory of those who lost their lives in New York on September 11th 2001 ... and New Zealand colleagues who have died in the execution of their duty. 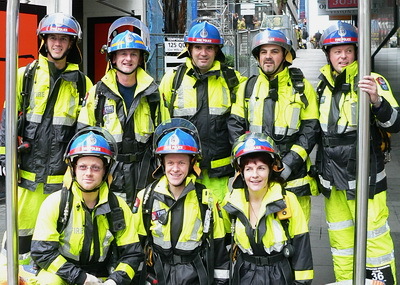 Members from the Unit participated for the first time, climbing to the top of the 28 floor tower-block on Queen Street, downtown Auckland. Each participant carried a replica tally of a fire-truck that attended Twin Towers, thus the memory of all crew members who responded to the tragic call were represented. 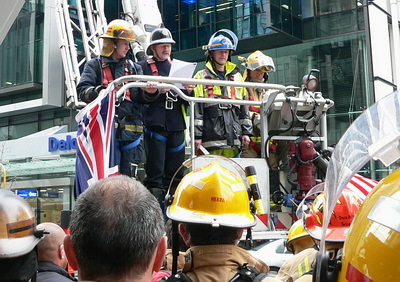 Unit member SO Ross Bay, Anglican Bishop of Auckland, led a brief remembrance service before the fire crews set off on the memorial stair-climb. A trail of destruction was left along Mt Eden Road early this morning as a car crashed its way from Pencarrow Road to Wairiki Road in a series of collisions. The car first hit another car forcing it into a light standard, bringing it down. 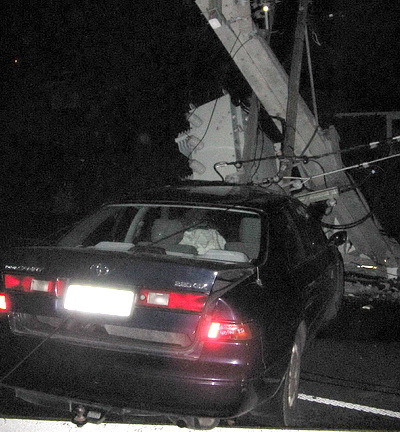 The car then continued towards the intersection with Balmoral Road where it collided with another car, and, out of control, hit 3 further poles before it crashed into a 4th pole bringing down wires and a transformer, jamming the car underneath them. 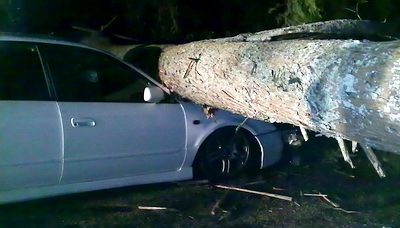 The driver had to be left in the car for more than an hour until electricity was turned off before he could be rescued. He walked unaided from the wreckage. Members closed Mt Eden Road, with detours in place, because of live power lines across street. One lane, city-bound, reopened just in time for morning peak hour traffic. The Unit's members responded to 3 calls tonight. The first, around 6pm, was a fire in basement accommodation on Dominion Road, Mt Eden from which fire-fighters rescued a man who was later taken to hospital for a check-up. Police and Fire Safety personnel are investigating the cause. 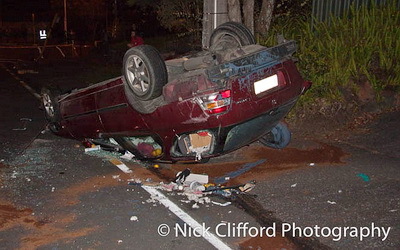 Before 9pm members were on the way to Maramarua, South Auckland, to a motor accident on State Highway 2. Three people died as a result. Members assisted with road closures and responded with the canteen. Then, within minutes, there was a further call at the other, Northern, end of the Unit's patch where at Waimauku there was a fire in Spectrum residential care premises. The irony is that the Dennis fire engine featured in the monthly magazine K1 will never again be 'K1'! Longer serving members of the Unit have watched progress over the years as member, Deputy Chief Ric Carlyon, has restored his vintage 1930 Dennis Dart fire engine. Now the old appliance has been written up in K1 magazine. But it's not expected to be 'K1'* ever again, enjoying quiet retirement in its own "fire station" out in the countryside near Waiuku and in the happy state of complete restoration. "It's fitting that the Dennis has been written up now that it's reached 80 years old," says Ric, "... a milestone we recently celebrated with a birthday party for the octogenarian. * "K1" is 'fire radio speak' for "appliance and crew responding to a callout". Members responded to a breakfast-time call to multi-vehicle accidents on Old North Road in rural Kumeu, the result of skids and slides caused by a diesel spill. As many as six vehicles and a motorcycle were involved at several locations along the road and members assisted with traffic management while contractors applied absorbent to help mop up the spillage. Police believe a vehicle travelled Old North Road earlier in the morning, the driver unaware he was dropping diesel, leaving a dangerous trail for about 10 kilometres. This weekend the Unit assisted organisers of the biennial Fire Field Camp held at Whangaparaoa under the auspices of the Auckland Districts Fire Brigades' Sub-Association. Volunteer fire-fighters from throughout greater Auckland attended two days of various exercises staged on closed Defence land at the end of the peninsula. Hot fire fighting, extrication from simulated motor vehicle accidents and an improvised light aircraft crash were among the scenarios. Members provided logistical support over the weekend and staffed the canteen, maintaining rehydration facilities at each of the exercises. A 1am fire destroyed the contents of Geoff's Emporium, a mixed-goods retailer on Lincoln Road, in a blaze which took fire-fighters several hours to control. The shop, about 60 x 25 meters, had high shelving throughout and the flames raced through the stacked merchandise as well as breaking out the front of the building through glass windows. Despite a 3rd alarm attendance with more than 15 appliances - including 3 aerials - members managed to keep Lincoln Road open to through traffic while fire-fighting continued. Fire-fighters prevented flames spreading to an adjoining college and radiologist's consulting rooms. The blaze is being treated as suspicious. 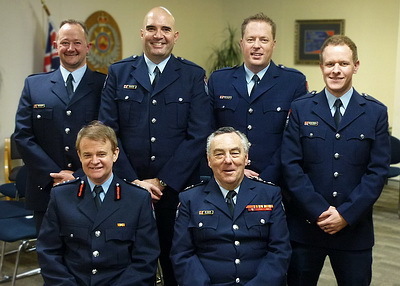 Members, past members and executives of the NZ Fire Service gathered socially to celebrate Jim Smith's 16 years' service as Officer-in-Charge of the Unit, 2 as acting-Divisional Officer and 14 as Chief Fire Officer. Jim has been a member of the Unit for a total of 37 years and recently stepped down from the Chief's position. He continues as Station Officer. Present Fire Police Chief, Glenn Teal, thanked Jim for his long devoted service - mentioning the progress the Unit enjoyed under his management, particularly 3 enduring aspects: the Unit's own radio communication network, the introduction of dedicated urgent-response Fire Police vehicles and its reputation, nation-wide, as a can-do ready-response group of well-trained personnel assisting at a range of emergencies. 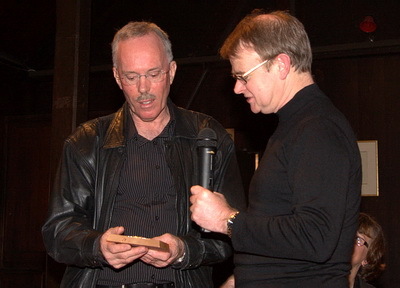 Jim Smith was awarded the Queen's Service Medal in 2006. Businesses were evacuated and main roads closed this evening after a major gas leak outside Nissan's premises on Roscommon Road, Clendon. Two cars involved in a crash crossed, out-of-control, over the grass median into opposing traffic, one car demolishing a roadside gas installation, tearing off its pipes. This released a high pressure jet of gas from a 50mm pipe with a continuous roar that was uneasy on the ears for 100 meters. Members helped closed main roads in the vicinity, and then managed the traffic grid-lock that resulted. Businesses nearby were closed until gas company engineers shut down the gas and declared the area safe. Roscommon Road and surrounds were reopened once the vehicles were recovered. Members of the Unit recently protected the scene and stood by watching as fire-fighters forced their way in to an armoured security vehicle to get at its contents. Unusual, but true - and it happened like this ... Fire Police were assisting with scene protection and road closures at an accident in Gillies Avenue, Epsom involving a bus, a car, a ute and an armoured security van. Owners of the armoured van insisted its contents be transferred to another security van on site before the damaged one was towed away. Trouble was its chassis had been twisted with the impact of the crash and keys no longer opened the door to release the cash. Breaking and entering tools off Remuera's appliance came in very handy. While Fire Police surrounded the scene, fire-fighters soon had the money liberated and transferred to the other security vehicle. A short time later all vehicles were removed and busy Gillies Avenue was reopened to all traffic. Serious motor accidents 'just kept on coming' over the weekend - the Unit has now responded to five in as many days, capped off with a 3rd alarm callout to a church fire in Ellerslie. The spate of road crashes began on Wednesday night when a young woman driver was killed in rural Waimauku. Fire Police were no sooner clear of this incident when a car plunged off the Southern Motorway at Drury and members went on to assist emergency services there. Early Saturday morning Fire Police assisted in Glendene where a car had collided with a speed camera support pole, severely trapping and injuring an occupant. On Saturday night Fire Police attended a 7 vehicle, fatal, crash on Auckland's Nor' Western Motorway between Patiki Road and Te Atatu. Today members again assisted police at Glendene again where, mid-morning, a pedestrian had been struck by a car, and before that call was over Fire Police were despatched to a car-versus-tree crash in New Windsor. And, adding to the busy weekend, as members completed chores at that call they were redirected to assist colleagues at a 3rd Alarm fire in a church building in Ellerslie. The blaze was quickly contained to part of the first floor. Fire Police were tonight among emergency workers attending a 7 vehicle crash on Auckland's Nor' Western Motorway between Patiki Road and Te Atatu. One person died in the accident which left 4 vehicles severely damaged, blocking all lanes on the motorway, with debris spread over nearly 100 meters. Fire Police provided inner and outer cordons at the incident which caused the west-bound lanes to be closed for more than 3 hours. Members also responded the Canteen vehicle to the scene. It's the 3rd serious motor vehicle accident that Fire Police have attended in as many days. 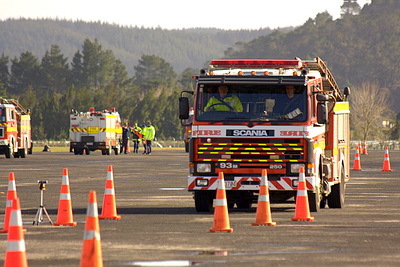 Members participated in, judged and supported this year's Auckland Fire Brigades' Sub-District Association's Drivers Challenge held at RNZAF, Whenuapai in blustery weather. 4 members entered the competition, a similar number acted as judges and officials and even more helped with 'essential services', like refreshments. For the first time in this event competitors were checked by an electronic device. It records both reaction time and braking distance. Duncan Milne of Laingholm Volunteer Fire Brigade won the event. 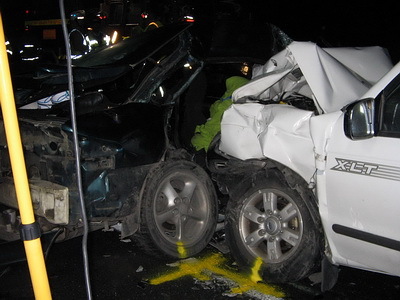 The weekend's begun with members attending 3 serious motor accidents. The first, late last night, involved an allegedly stolen car crashing into a house in Onehunga leaving one woman dead, 2 others injured. 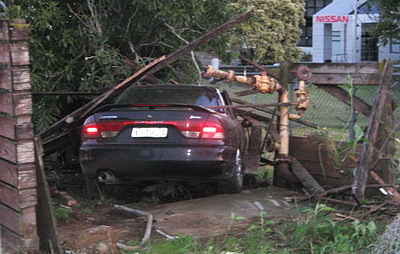 The second accident occurred early this morning on Waterview Straight, Avondale, where three cars collided, one crashing through a brick fence, leaving four injured. Help was not far away this afternoon when 2 cars and ute crashed on the intersection of Kingseat and Glenbrook Roads in South Auckland. Local fire brigades, returning from an exercise at Glenbrook Steel Mill came across the accident which left several people trapped in vehicles, others being treated on the roadside, and the intersection littered with wreckage. Two serious patients were airlifted to hospital by helicopter. Members of the Unit, also en route from the Steel Mill, delayed their return home by several hours to assist with traffic management while police made their scene investigations. A new-style structured training regime begins this week for the Unit. It ensures each member revises current skills and learns new ones, thus obtaining core competencies now required for proficiency. "The reason for the change is that it won't be long before the Fire Service formally introduces its Training And Progression System (TAPS) for support personnel", says Unit Chief Fire Officer, Glenn Teal, "so, in anticipation, we are training now in the competencies we know will be part of the TAPS programme. And because this is likely to be closely followed by the Operational Skills Maintenance programme, it's our aim to have members trained and showing green lights (indicating proficiency) on OSM charts immediately they come on-line". 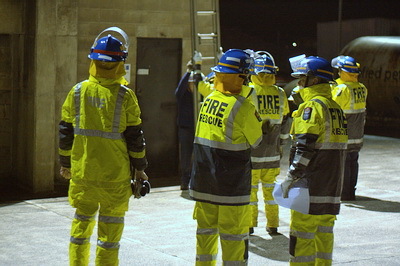 The new training regime, which strictly follows NZFS instruction manuals, began by qualifying assessors so they can evaluate each member undertaking the training. 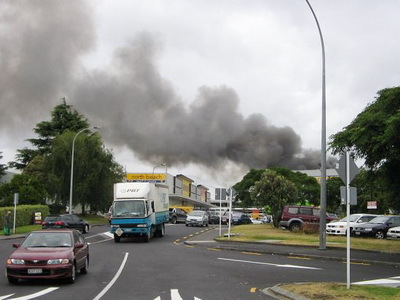 Queen's Birthday holiday was interrupted for members, late afternoon, by a 4th Alarm response to Mangere East Primary School where fire was simultaneously racing through 2 buildings. 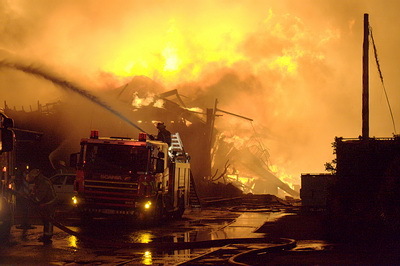 Fire police supported fire-fighters, assisted with traffic management, crowd control and other fireground duties until the flames were subdued when salvage operations began. "We had 30 members fully engaged at the call for more than 4 hours" says Fire Police Chief Glenn Teal, "and there was a big effort with lighting to enable us to get on with an even bigger task: salvage of computers, books and teaching aids which had been affected by water, heat and smoke. Hopefully the rescue of these resources will hasten the school's recovery". Investigations into the cause of the fires have begun. ... and then the walls tumbled, debris venting the fire. Fire fighting concluded early this evening at the derelict Southdown meatworks and associated buildings in South Auckland. The Fire Service had been tackling the major blaze, and its aftermath, since Friday night using a number of aerial appliances, dozens of fire engines and hundreds of fire fighters, supported by a big team of workers including members of the Unit. Decontamination processes were essential for all those firefighters who had worked within an area which had been declared a risk from chemicals. The smouldering remains were considered extinguished mid-afternoon and then began the task of retrieving all Fire Service equipment, including kilometers of hose used to feed sufficient water to the fire engines on site. The fire's being treated as suspicious. Four aerial appliances, a fleet of fire engines and a small army of firefighters are still dousing the major fire in the former Southdown meatworks. Some of the buildings destroyed overnight are ones that escaped serious damage in the December 2008 fire in the same complex. Today firefighters are tackling pockets of fire under rubble and twisted metal, the result when, at the height of the fire, part of the building collapsed. At that stage flames, and columns of thick black smoke and embers, could be seen from most parts of Auckland, and as far away as Waiheke Island. Indications are that road closures, long feeder hoses (twinned, taking water from hydrants more than a kilometre from the fire) and support services will remain in place while fire fighting continues all day and on into Sunday. A massive fire-fighting operation's underway tonight in the Auckland suburb of Southdown where the old meatworks and associated premises are well alight. At 5th Alarm status, it's shaping to be the biggest fire in the city since flames raced through an adjacent range of buildings on the same site in December 2008. 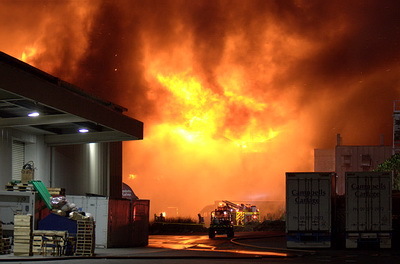 The earlier fire was said to be the biggest in Auckland in many decades. The Unit's Chief Fire Officer, Glenn Teal, tonight asked all available members to respond to the call to assist with traffic and crowd control, setting up support facilities, and fetching ancillary vehicles to the scene. Members of the Silverdale Fire Police are supporting their Auckland colleagues. "We are planning for the long haul", says Glenn Teal, "it looks the same as last time's spectacular and stubborn fire ... firefighters were here for days and we kept up our support for them then, and we're planning for a repeat." Most activities at Auckland Airport's International Terminal came to an abrupt end this evening when a gas leak forced evacuation of most of the building and closed all roads leading to the building as well as the car park. Members responded to Mangere when an emergency was declared about five o' clock. A gas main had been ruptured by a contractor's digger on the construction site of a new hotel, just meters from the main terminal building. The airport's international operations were curtailed for an hour and a half until the Fire Service and gas company staff made the pipe safe and the fumes had dispersed. Some overseas flights were delayed. Members of Auckland Fire Police were among Government, Local Body, Fire Service and Community representatives who attended the unveiling of a commemorative plaque and tree at Tamahere in Waikato, scene of the Icepak cool-store explosion and fire two years ago. 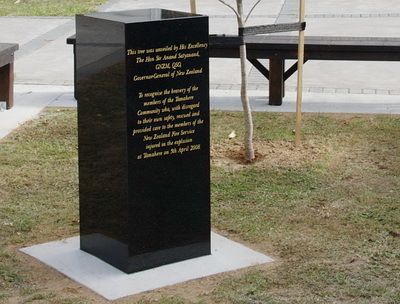 The ceremony, the plaque and tree were the New Zealand Fire Service's way of thanking the people of Tamahere community who, despite risks to themselves, went to the aid of firefighters killed and injured in the explosion and fire. 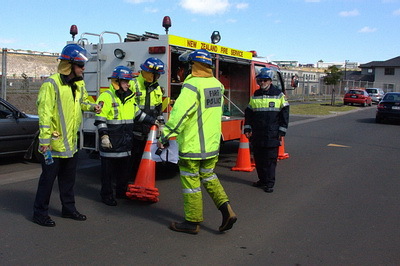 Auckland Fire Police attended in its regional support vehicle: ours was the furthest responding appliance. Our members worked overnight side-by-side with the Tamahere community, supporting fire-fighters from throughout Waikato, and beyond, as they battled the major fire which claimed the life of Hamilton's Senior Station Officer, Derek Lovell. The dedication of the plaque and tree was attended by many dignitaries including the Governor- General, Sir Anand Satyanand, Minister of Internal Affairs, Nathan Guy, Chairperson of the NZ Fire Service Commission, Dame Margaret Bazley and NZFS National Commander, Mike Hall. One of our members, Station Officer Ross Bay, is now Anglican Bishop of Auckland following his ordination and installation this afternoon. The Unit was well represented in the packed congregation at Holy Trinity Cathedral and members were among the first to congratulate the new bishop after the service. The Very Reverend Ross Bay is 11th Bishop of Auckland, the largest diocese in New Zealand, stretching from North Cape to Waikato. 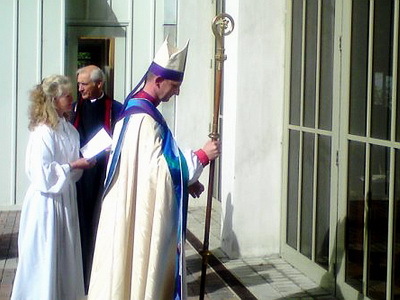 Immediately following his ordination, Bishop Ross was welcomed by the cathedral community in the service of installation. This began with Ross following the ancient tradition of knocking three times with his pastoral staff on the closed doors of the Cathedral. He gave the doors a good rapping with the 120 year old staff: those inside could not but respond, the huge doors were swung open, welcoming Ross to the cathedral, and to the Bishop's chair, a sign of his office. Members answered a breakfast-time callout to assist at the high-rise downtown office block which was suffering severe water damage. First fire crews on the scene in Shortland Street saw water pouring out windows and guessed there was major flooding in the AXA building. Sometime over the weekend a water pipe had burst on the 7th storey, causing water to cascade down the stairway, through lift shafts, ducts and ceilings, affecting all lower floors. Fire-fighters stemmed the flow, effected first-line salvage and then left it to the building's owners to arrange the massive cleanup. It's been a weekend of training for Fire Police and Operational Support people. 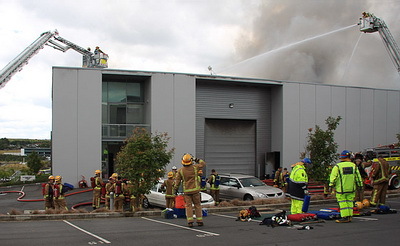 First there was a "Train the Trainer" course at the Fire Service's Mt Wellington Campus, organised by NZFS Training in Wellington, for personnel from many parts of New Zealand. They were shown techniques for teaching the basic content of their new Training and Progression System (TAPS). 3 members of Auckland Fire Police were on the weekend-long course, while some other members from the Unit assisted with teaching and exercises. The second training event was a local affair for our own newer members, concentrating on learning basic water-way equipment with elementary routines. "New nation-wide targets are about to be introduced for training", the Unit's Chief Fire Officer, Glenn Teal, says "so these courses are a flying start towards having all our members fully qualified within the deadlines set". Members closed busy main thoroughfares during this morning's gas leak alert near the Medical School in Grafton. 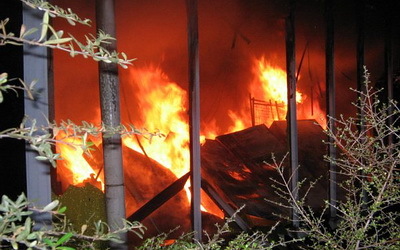 The Fire Service ordered all roads in the vicinity closed in case vehicles' electrical systems ignited the escaped gas. Fire Police put in road blocks over a wide area surrounding the Medical School. "Unfortunately these road closures also affected the main entrance to Auckland Hospital, right opposite the School, and we had to turn away out-patients with appointments, those visiting patients, doctors and hospital staff", says Fire Police Deputy Chief Fire Officer, Ric Carlyon, who was on the scene. "It was all we could do to keep traffic moving in the suburb and we used Grafton Bridge as an additional outlet during the traffic emergency: it's usually closed to private cars during the day. While buses were diverted, fortunately ambulances taking urgent cases to the hospital had alternative access beyond the no-go zone". The emergency lasted nearly 2 hours until the leak was contained and the gas dispersed. March's wintry look in Mt Wellington with the temperature (plus) 28 degrees C! 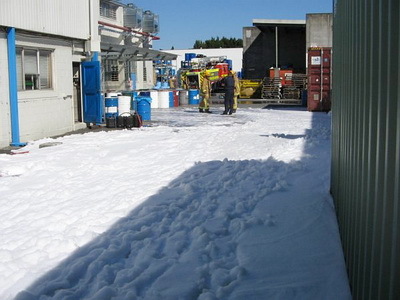 Although it was one of the hottest days of the summer, onlookers at a South Auckland factory fire this afternoon could be excused for seeing snow at the scene. It was, in fact, a deep carpet of white foam cascading from the Mt Wellington building, the result of fire-fighters' operations to quell a small blaze in the chemical factory. One person was taken to hospital, injured in the fire. Firefighters created a bund around the premises to contain run-off from the fire in case it was contaminated. 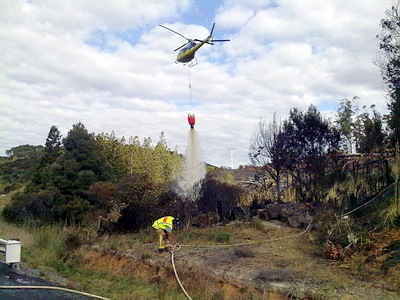 Auckland Fire Police responded north today to assist at a large bush fire beside State Highway 1 in Dome Valley between Wellsford and Warkworth. The busy road was closed to enable firefighting operations by both Fire Service and Rural crews. Fire raced up steep territory and burned out of control until a helicopter arrived to help fire-fighters with an aerial attack. Members assisted with scene protection and security, helped marshal fire trucks and equipment to enable the highway to be reopened and augmented cold drinks being dispensed by Silverdale Fire Police. The Unit has a new Chief Fire Officer from today. CFO Glenn Teal, a member of Auckland Fire Police for 30 years, the last 15 as Deputy Chief, takes over leadership from former Chief, Jim Smith, who has stepped down from the top position. "I look forward to managing the country's biggest and busiest volunteer brigade, particularly in the light of recently-signalled changes to Fire Police," says Glenn, "but we are in good shape to meet these challenges with assured support from all our Members who want to continue contributing voluntary services to our community". Ric Carlyon is appointed the Unit's new Deputy Chief Fire Officer. Numerous tributes were paid to Jim Smith at his last Unit meeting as Chief, recalling the Unit's progress during his term and thanking him for his service. He continues in the Unit as Station Officer. Members responded in the early hours this morning, answering a request for the Unit's Canteen in Waikato. Emergency services were attending a serious crash on State Highway 1 near Rangiriri where a truck had veered off the road, smashed through a barrier and caught fire. The driver died in the accident. The highway was closed as police carried out on-site investigations into the crash and while experts identified liquid, potentially hazardous, which had spilled from drums carried on the truck. The canteen provided emergency teams with food and drinks throughout the night. "This is one of our Southern-most calls" says Fire Police Acting-Chief Fire Officer, Glenn Teal, "and the Unit's always pleased to respond and provide resources when called upon". The number of incidents fire-fighters turned out to early this afternoon may be something of a record: they were at 8 different incidents at the same time, spread right across Greater Auckland. Members responded to 2 in the string of calls, first assisting at a major fire in two storey house in Blackbridge Road, Karaka in Franklin and they were still there when the sudden burst of calls began about 1320 hrs - twenty minutes past one. The first was to a vessel on fire in Westhaven Marina (which Fire Police also responded to) where fire-fighters quickly contained the on-board blaze. Other calls in quick succession (and attended by the Fire Service simultaneously) were in Ponsonby, Mt Albert, Avondale, Silverdale, Whenuapai and in Kelston. Some were false alarms: none of these proved serious. Today's call-out was to Pah Road, Epsom, near Seymour Park. The reserve has a line of towering trees along its street frontage and a major lower limb had crashed over the busy road causing a danger to passing traffic and a bottleneck for morning commuters. Pah Road is an arterial route, the preferred road between the city and the airport so traffic rapidly built up. It's thought the limb splintered and crashed under the weight of saturating water from early morning heavy rain, the first in Auckland for some weeks. Fire Police managed traffic, including a diversion for trucks and buses, until tree-fellers arrived with chain saws to clear fallen branches. Tonight's fierce fire that raced through an Ellerslie factory escalated to a 4th Alarm and took the best part of an hour before fire-fighters got the better of it. 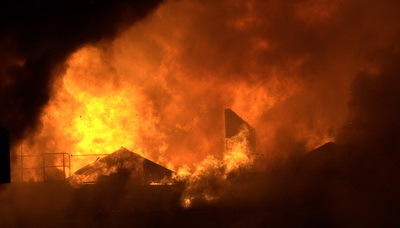 Hunter Haines' made fibreglass pleasure craft in the large 2 storied building which quickly became engulfed in fire and was gutted by the blaze. A "Hazardous Materials" warning went out to all members responding to the call and two Fire Police whose duties took them inside the Hot Zone were among personnel decontaminated at the scene as a precaution. Ironically there were more than a dozen elevated platforms on hand: the company next door to the burning building is a hire company specialising in cherry pickers. The Fire Service, however, stuck with its own 3 aerial appliances to fight the fire! Members responded to a call for help from Police earlier today on the Southern Motorway near the Otahuhu Off Ramp. Investigations were underway there after a dual wheel assembly had parted company from a truck-and-trailer's tractor unit and, for a short time, was loose on the motorway, bouncing between vehicles. It then bowled into the front of a bus, smashing through the windscreen, entering the coach. The wheels missed the driver but hit several passengers, one of whom was critically injured. Parts of the motorway system were closed as police made their scene examination. The Unit's busy, and varied, first week of the New Year is continuing. In the early hours of today there was call to a student lodge in Galatos Street, Newton, but damage was confined to one room. Then at about half past ten there was a blaze in a warehouse/showroom complex at St Lukes which quickly escalated to a third alarm. The factory was situated at the end of a cul de sac, Wagener Place, opposite one of the main entrances to St Lukes Mall. Members closed the no-exit road, denying access for several hours to retail shops, light industrial premises and 3 child care facilities. Other Fire Police assisted at the command unit, kept access-ways clear for further responding appliances and staffed the canteen, providing refreshments. The fire, which gutted most of the building occupied by architectural lighting experts, is classed as suspicious. Today's second-alarm response in downtown Auckland capped a series of diverse calls in the first week to begin the New Year. This afternoon's suspicious fire, in Fort Street, was on the top floor of a two storey block, seriously damaging a massage parlour there and causing heat, smoke and water damage to a downstairs restaurant and a basement internet cafe. Members closed off surrounding roads and several car parks in the busy central business district to enable fire-fighting operations. Today's call-out adds to the variety of other calls this week... a bush fire, 6 house fires (several with persons reported), a motor vehicle accident, and a fire following an explosion and fireball above restaurants on Prince's Wharf.